While enjoying a fine cigar is certainly more of an art than a science, there a few essential skills you should master in order to get the most out of the experience. What better place to start than with a good, clean cut? It’s worth pointing out that, when it comes to cigar cutting, there are many different tools. Some people use specially-crafted cigar scissors, some use a sharp knife, a cigar punch, a V-cutter—some even use their teeth. But the most common tool is the guillotine-style cigar cutter. We recommend the guillotine cutter for most cigar smokers because knives and teeth usually don’t yield clean cuts. Cigar scissors are nice tools if you know how to use them (they require precision, practice, and a keen eye). 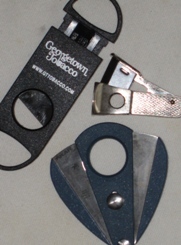 And cigar punches and V-cutters, while perfect for some cigars (use punches on stogies with tightly-packed fillers to ease the draw and V-cutters on cigars with small ring gauges to increase surface area), are not always the best choice. In order to use the guillotine cutter, take the head of the cigar and position it so the blade will enter the stogie just above the shoulder (where parejo cigars stop being round). If you’re planning to smoke a torpedo or a pyramid, a good rule of thumb is to slice off about a quarter inch. No matter what the cigar size, though, keep in mind that it’s better to error on the side of cutting too little. You can always go back and carefully re-cut if the cold draw is too tight. But if you cut too much, there’s no going back. With the guillotine in place, press down firmly until the blade completely passes through the cigar. If the blade is sharp and the stogie is in good condition, you will get a nice clean cut. You may want to invest in a double-guillotine cutter (that’s a guillotine with two blades instead of one) to ensure even cleaner cuts. Finally, for a cigar that typically exhibits a tight draw, try cutting the head at a slight angle instead of straight up and down. Angled cuts will increase the surface area of the exposed filler and thereby make it a little easier to pull through. Thanks for the 5 years. Learn a lot here. A lot of us like V-cutting for torpedos. I do something you write but did not know why. I don't prefer using a punch but use the one at the bottom of my lighter sometimes. Just realized, it's for some tightly packed gars. Ditto on the thank you for the five years. It's amazing how much insightful content I've gotten from you guys for free. As for cutting, one other tip is to gently brush away excess tobacco bits with your finger after the cut but before the first draw. This will minimize the chances of getting the bits stuck between your teeth. Good advice. I use the double-blade guillotine the most, and keep a V-cutter around for figurados. Re technique: I generally cut the head just below the surface of the cap. I find that cutting too close to the shoulder can ofter cause unraveling. As you point out, too, better to cut less than more.